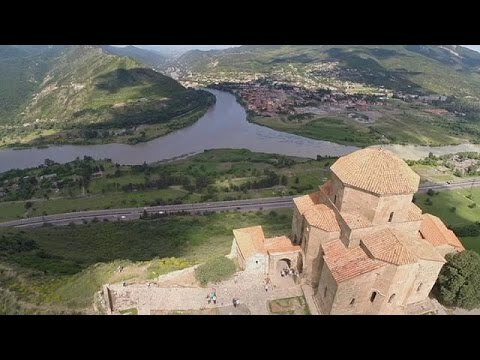 In the first of our series exploring the sights and delights of Georgia, Georgian Life, we begin our journey in the country’s largest city and its capital Tbilisi. The stunning view from the hill above the city shows a patchwork of ancient and modern urban spaces, reflecting Tbilisi’s history from its foundation in the 5th century to the latest architectural achievements. “This is one of the longest and steepest funiculars on Earth. Visitors to Tbilisi can take a ride to enjoy the breathtaking view from the top of the hill,” funicular operator Emzar Badalashvili tells us. Tbilisi’s old town with its narrow streets and eclectic buildings has been renovated recently, giving it new life, with many little shops and cosy cafes. “Georgia is trying to preserve its ancient history. Sometimes a plain stone at a corner can tell you more than a book of many pages,” says Rezo Gabriadze, a Georgian artist we meet in the capital. Emerging from the long Soviet era and the severe difficulties the 1990s, today’s Georgia has reinvented itself as an open, friendly country, welcoming guests from all around the world. In this bright kaleidoscope of modern and traditional architecture, famous landmarks still teem with life. Religious architecture and art remain at the core of Georgia’s ancient heritage. It was one of the first nations in this region to adopt Christianity. Just outside Tbilisi, ancient castles, monasteries and cathedrals crown the magnificent Caucasian landscapes, bringing scores of tourists and pilgrims to the holy sites. It’s generally acknowledged that in Tbilisi old meets new, and the East meets the West. However, once you come to visit, you’ll probably find out that there’s much more “new” around than you might have imagined, and you can have hard time finding a striking difference between Georgia’s fast-changing capital and many Western cities. Tbilisi feels surprisingly European, even though its traditional cultural heritage is carefully preserved in and around the city – most prominently, its ancient churches, castles and monasteries built of stone in a very distinctive Georgian style, with curious ornaments, bas-reliefs and icons. In a striking contrast, Tbilisi’s modern architecture with its literally transparent public buildings, futuristic bridges and out-of-this-world theatre shaped like two wine jars, shine bright in newer districts, symbolising the change the state has gone through in the political turbulence of the last decades. People are welcoming, helpful and generally rather relaxed; when you come as a guest you’ll find that all the doors are open.There’s no haste, the day doesn’t start very early and may continue well after the nightfall. Most of the younger people speak English, Russian is still very widespread, and it’s not uncommon to find those speaking in French and other foreign languages. You wouldn’t want to miss a ride on one of the longest and steepest funiculars in existence. It’s been lifting public to the top of the hill overlooking Tbilisi since 1905, and was recently renovated. There are a cafe and a restaurant at the top with panoramic terraces. At the foothills, the Old City is the magnet for tourists, with its narrow streets and typical buildings from the past couple of centuries, some freshly restored, others looking fragile and dilapidated. The famous Sulphur Baths is an attraction you can smell from afar; the natural springs, up to 40 degrees hot, provide these establishments with a constant supply of bathing water. Open for tourists, several competing underground baths, covered with instantly recognisable red brick domes, offer the original foam massages like the one you can see in our story. Tbilisi is also a popular departing point for a variety of exciting trips around the country, which often include wine tasting tours in the grape-producing regions in the East and, in summer’s hottest months, travels to the Black Sea resort Batumi known for its beaches and booming nightlife. Food is an important and particularly enjoyable staple in Georgian way of life, and it’s easy to find (especially outside of main touristic areas) excellent restaurants with large portions that would cost three-four times cheaper than similar meals in the Western Europe. Getting around is not a problem, with taxis seemingly everywhere; a trip within the city would only cost an equivalent of 3-10 euros, but you should be morally prepared to frighteningly speedy rides in cars of variable age and random steering wheel placement. The drivers don’t take cards, have no change and protest loudly if you try to fasten your (usually disabled) back seat belts. Throughout your whole joyful experience in Tbilisi you won’t have to keep your Internet addiction at bay, since free and open WiFi is omnipresent in cafes, on fuelling stations and public squares, which is far ahead of most of other European destinations. So next time you’re in Tbilisi, check out our website for more travel ideas!